The field of real estate has always and will always provide its challenges. Buzzell, Blanda and Visconti, LLP provides representation and guidance to meet those challenges in all aspects of commercial and residential real estate transactions with a unique perspective on the Long Island community. The Firm counsels clients on the purchase and/or sale of real estate as well as with regard to leasing and financing and the use and development of commercial and residential property. The Firm's Attorneys rely on knowledge and experience to offer creative solutions that focus on the client's needs and interests. 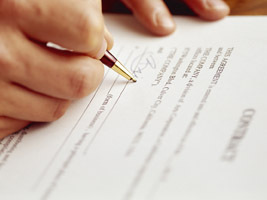 Real estate services include preparation and negotiation of contracts of sale, leases, easement agreements, development agreements, restrictive covenants, license agreements and financing documents, as well as resolution of title issues, assistance in both pre- and post-contract due diligence, preparation of closing instruments and representation at closings. For individuals forming new businesses and experienced businesspersons who want to protect their assets and other investments, establishing a corporation, partnership or Limited Liability Company is an important and often necessary tool. The Firm's Attorneys work with our clients to establish the most appropriate business formation to suit the client's needs.